I’ve been reading threads about wheel changes to a Momo model 7 with interest of late. At 6’1” I find the driving position really comfortable with the standard wheel. With the seat most of the way back I don’t have leg room issues either (no need for the console delete). So, my question - with the momo boss kit and model 7 how much does this move the steering wheel closer to the driver? I know the dish is 70mm so wondering if the boss adds more distance (or subtracts) to the net change? Just thinking a flat prototipo may be a better choice? I’m 6-3, and recently fitted a mono cup wheel. Transforms the driving position, bringing the wheel about 2” closer. Just changed mine to a MOD 07. I'm 6ft. My problem is / was that I found it difficult to heel-toe with the standard wheel. The Mod 07, being a little closer to the body and a smaller wheel has got rid of this problem. Furthermore, the wheel is lighter, so turning and throwing into the corners feels nicer in the hand. I like some of the cup versions but I cant get away from the fact that I would be removing the airbag. Just seems wrong to remove such a vital safety piece. I think those like Sunday Jumper have harnesses, and therefore less of a safety issue. Those like myself, I see driving my 911 an "experience" and therefore, the thrill is something I look forward to. With all things there is a degree of risk, and everything is a compromise. This, coming from a guy who also rides motorcycles haha. I also have a 924, that has ZERO safety features. It's that raw element that gives me a thrill too. Your comments are not incorrect.. but the wheel for me has made a big difference to the experience in driving the car. I’m near Lutterworth in Leicestershire. I would like to change my wheel to a smaller cup but that would mean I don't have a car that I can drive on business anymore. 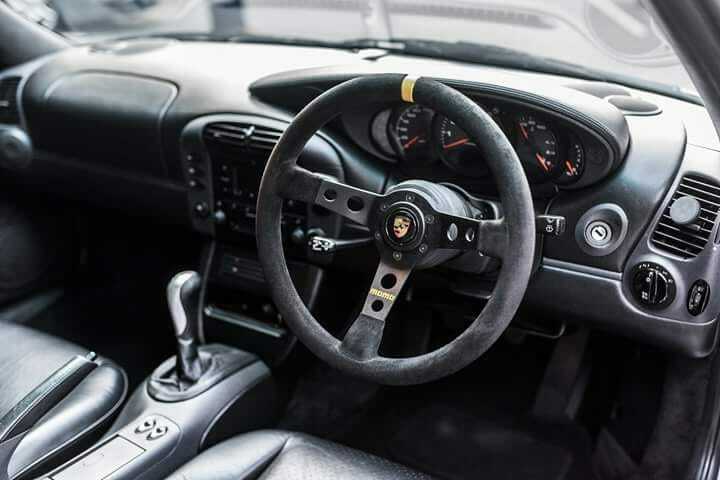 So, my question - with the momo boss kit and model 7 how much does this move the steering wheel closer to the driver? The MOMO boss also leaves a bit more of a gap between the boss & the steering column so you gain a few mm there and with a bit of rounding in the other numbers you end up at ~40mm overall. And remember that you also have about 40mm of in-out adjustment in the column anyway. So if yours is all the way out at the moment, you could switch to the 07 wheel and push it all the way in and you'd end up pretty much where you are now. Or, if you're all the way in right now, you could end up with the wheel 80mm closer. The other thing to consider is that increasing the dish of the wheel puts your hands further from the indicator / wiper stalks. You get used to it but it feels a bit weird at first. If you have small hands then the Prototipo might be a better bet. Thats brilliant and exactly what I was hoping for. I’m not sure where the column is adjusted to currently so will check. I’m also taking up Ian’s kind offer to check his momo out. Hands are in proportion to my 6’ plus frame so should reach OK !! Anyone fitted an OMP? £45 new Vs £200 for the momo. Dont look too different!? Guessing the OMP still requires a boss that's extra too. 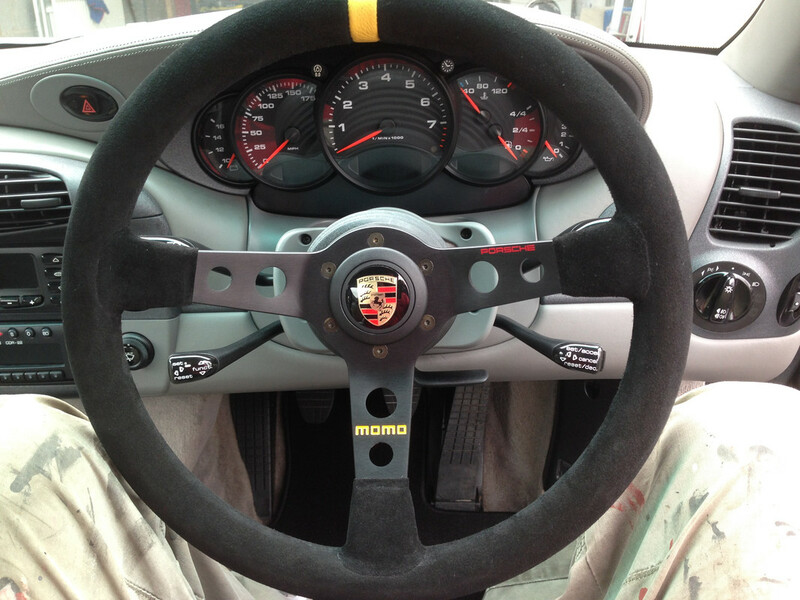 I'd stretch to the momo as it's what Porsche Motorsport actually used for the 996GT3 cup cars, hence OE. Plus all the parts are available for easy fitment, e.g. Pin to run wire for horn, brass contact pad to get power to horn via momo boss, etc. 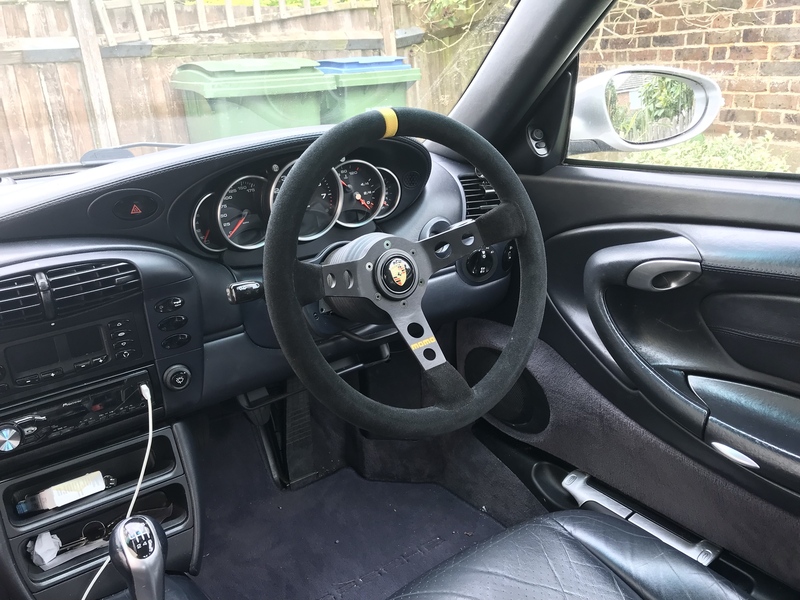 You can do the whole thing brand new for sub £250 which is a fair chunk of cash but better than the official Momo for Porsche with Porsche engraved in, which now costs £550 due to recent price hikes. Here's mine in my grey cabin. That looks superb! I've recovered my own wheel, but id consider changing it for that. What size is it? Is that price new or 2nd hand? Cannot find any new ones for that price region! Post a link please if new.